YouTube/Zebra CornerA still from a spoof of Apple’s ‘What’s a computer?’ ad. The ad is meant to portray a world where computers no longer exist and kids don’t even know what they are. Many who have watched the ad say it rubs them the wrong way, and parodies have sprung up on YouTube. Apple’s new commercial showing off the multitasking prowess of the iPad Pro and iOS 11 is rubbing some people the wrong way. And now, even YouTube comedians are joining in on the fun. The ad shows a kid, age unknown, retiring to her grassy backyard after a day of hanging out with friends and doing school projects with her iPad Pro in what appears to be Brooklyn. A neighbour asks her what she’s doing on her computer. “What’s a computer?” the kid replies. The ad is meant to show the versatility of the iPad (and some in tech media have speculated it’s a subtle dig at Microsoft). In this fantasy Apple world, traditional computers are so outdated that a child doesn’t even know what they are. Of course, that’s not the world we live in. Computers are still how the vast majority of work gets done, and the word “computer” is still part of the public consciousness – even for a child. That fact has not escaped some viewers who say the kid’s question can be perceived as insolence. Now, even YouTube comedians are getting in on the criticism. YouTube collective Zebra Corner has parodied the video, with a comedian known as “Mahk” standing in as the neighbour who asks the child what they’re doing. 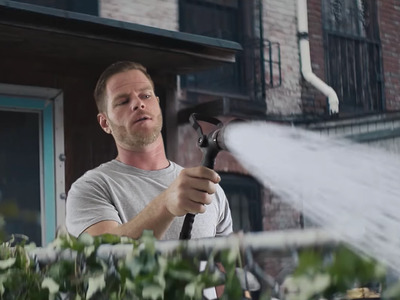 Instead of the commercial ending, however, he gets out a hose and sprays it with water. A little sound effect plays to tell the viewer the iPad device has likely been ruined.